THQ and Vigil Games are serving up the second chapter in the adventures of the Four Horsemen of the Apocalypse. Darksiders II follows the exploits of Death in an original story that intersects with the original game and features appearances by that game’s protagonist, War. This sequel, of sorts, sends the agile Death and his horse Despair on a journey of redemption through light and dark realms as he tries to right his brother’s name. Han Randhawa, art director at Vigil Games, talks about this deeper blend of role-playing game exploration and action in this exclusive interview. Game On: What is Vigil Games showing new at E3 for Darksiders II? Han Randhawa: What you’re going to find is that you’re going to be introduced to a lot more of the other aspects of the other dungeons in the game. We have four major visual areas. There are probably a few other little areas, but they’re the four major ones. You’re going to get a chance to see the Maker’s area. Ulthane were introduced in Darksiders, and you get to see a lot more about their lure. It’s a much deeper level of what they’re about, how they fit into this universe, and of what consequence are they to the whole story of Darksiders. You’re going to see a lot of the Angelic stuff. You only saw a tiny snippet of Angelic stuff in Darksiders I, so you’re going to see way more of that. You’re going to get to meet a lot more Angelic characters. What are some of the other realms? Darksiders wouldn’t be Darksiders without seeing a Demon realm. You’re going to see a bunch of Demon dungeons and things like that. Also, potentially you’re going to see a lot of familiar characters. You’re going to see a whole bunch of brand new characters. There’s a Realm of the Dead. As you can imagine, it is going to be very interesting to see Death in the Realm of Dead, and how he interacts with the denizens of that. What role will Death’s horse, Despair, play in this sequel? The key thing for us was to add more horse gameplay. We listened to a lot of the feedback that we got from fans of Darksiders I who complained that the horse traversal occurred way too late into the game. We’ve addressed that so you’re going to get Despair very early on in the game now, which is going to let you explore further areas. You’re going to need him because of how vast the actual areas are. He’s necessary just to get around. How are you implementing the horse into gameplay? You can’t go everywhere with a horse, so you’re going to have to get into puzzle elements and what have you. But the horse is going to let you go over to places you could not ordinarily get to. You’re also going to find yourself a little bit more combat on the horse, but it’s still very much a Death show. It’s very much Death in combat, and traversal and puzzle elements. Bu Despair will play a key role in certain boss battles. What is the most exciting aspect of this sequel that fans will like? For me, coming from the art background, it’s just seeing the visuals take on a whole new aspect of what I wanted to really do with the first one. 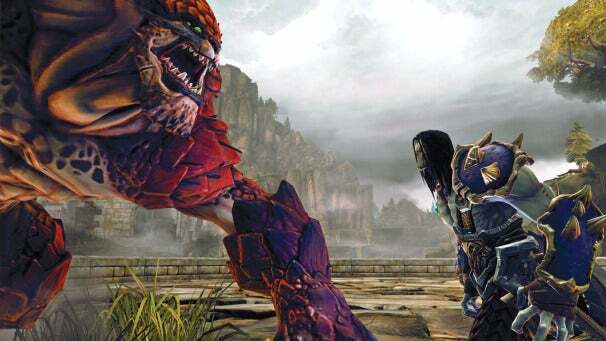 I really felt that even though we had a very semi-realistic environment on Darksiders I, there was a characterization that was missing that I wanted to bring to Darksiders II and get them working closer to the characters. The characters are super-stylized. We have Joe Madureira working with us on a creative capacity. To me, the environments needed to match that. I’m especially proud of the way the environments are turning out with the lighting and the composition. There’s a rich, stylized aspect to the environments, which I don’t think we had as much in Darksiders I. What did you enjoy about this game’s new direction? We spent a lot of time on Earth in Darksiders I. In Darksiders II, we’re going to go full-on fantasy; we’re basically going to see a lot more of the traditional fantasy dungeons. That is very interesting because it allows us to explore a true environment, one in which I can see these characters really living and breathing in.